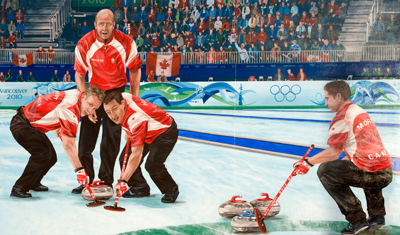 Canadians around the world held their breath as Team Martin swept its way to the 2010 Olympic gold in curling. To celebrate this victory, one wall of the building where skip Kevin Martin worked as an ice maker depicts him in action, shooting the winning rock to win the Olympic trials. The other shows Kevin Martin, John Morris, Marc Kennedy, Ben Herbert and Team Martin coach Jules Owchar receiving their Olympic medals. 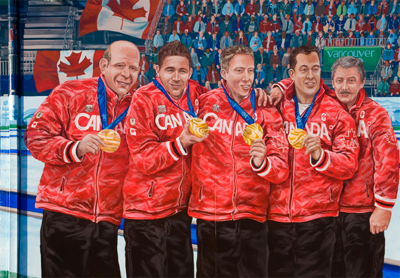 As of the date of the mural (since 2006), this Edmonton-based team has also won four Alberta Championships, two Brier Championships, the 2008 World Championship and 10 Grand Slam titles.